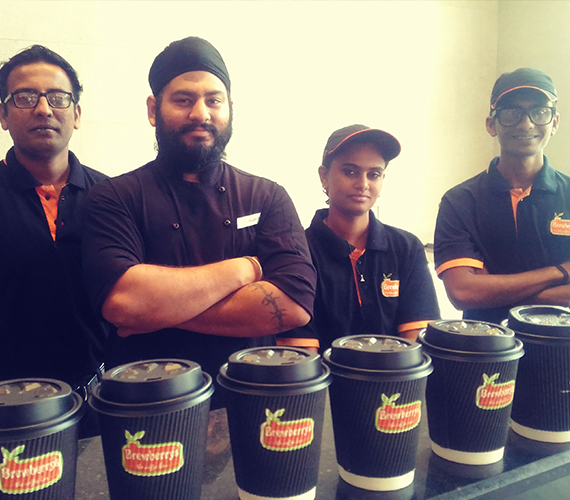 As one of India's leading café chain, we offers a wide range of interesting job challenges and opportunities in different divisions. At Brewberrys Café, we consistently urge you to broaden your horizons to make use of your full potential in entire phase of new learning opportunities. Our development programs enhance your all- round personality via performance coaching, e-learning solutions, soft skills training, train-the-trainer etc. We have an intact performance management system that mutually helps us recognizing & evaluating your true potential and in parallel, helping develop your career better. To be more than an employee and make a difference. To be a part of growing company of young and talented professionals. To get the opportunity of being recognized and rewarded. To have a great career path by taking initiatives and being creative. We at Brewberrys believe in our employee's potential and constantly provide a platform to grow in their career by motivation and training. We enable active involvement of each employee in different teams, give each of them enough leverage to take the initiative and achieve results that really make a difference. We always aim to improve our performance at touch points with our guests through individual contributions and teamwork. From ingenious ideas to a continuous way of improving performances: At Brewberrys, we recognize, respect and reward your commitment & teamwork in order to create more value.